Vuelta wheels have been deemed the fastest wheels in the world ever since Ondrej Sosenka shattered the hour record racing Vuelta Carbon Pro wheels. And now Lexco is distributing Vuelta wheels. Made in Italy, Vuelta wheels come in various weights and aerodynamics both in tubular and clincher rims and Vuelta or Shimano hubs. The wheelsets feature their own aftermarket packaging, which makes them both attractive and great sell-throughs. And many of the wheelsets come wrapped with Michelin clincher tires including the amazing entry-level Vuelta Starlite wheelset (road or mtb) featuring Shimano hubs, Michelin tires and a retail price of only $199.99. Carbon Pro Chromo WR - Features a Monocoque Carbon Fiber Tubular rim, rear disc wheel and a four-spoke Monocoque Carbon Fiber front wheel. MSRP: $3,999.99. Carbon Pro WR - Complete with Zipp "highwall" full carbon fiber rim with CNC'd Alpina alloy spokes. Comes in both tubular and clincher versions, silver and black. Clincher rims feature Michelin Krylion Carbon tires. MSRP: $1,999.99. Carbon Pro - Similar to the Carbon Pro WR wheelset but with Vuelta carbon fiber rim for more affordability. Comes in both tubular and clincher versions, silver and black. Clincher rims come wrapped with Michelin Krylion Carbon tires. MSRP: $1,399.99. Carbon Pro Matrix - A clincher-only wheelset featuring carbon fiber rims with Alpina CNC spokes. Michelin Pro Race II clincher tires complete the package. Available in silver or black. MSRP: $1,099.99. 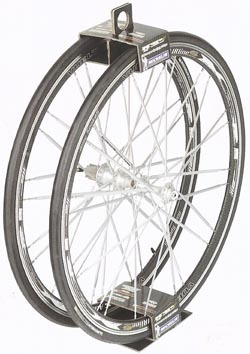 X-Lite Corsa - A clincher wheelset in silver or black that features aero alloy rims and spokes. Wrapped with Michelin Pro Race II clincher tires. MSRP: $599.99. ChromeLite - Aero alloy rims with stainless steel spokes and Michelin Pro Race II clincher tires. MSRP: $299.99. StarLite - Clincher aero alloy rims with stainless steel spokes, Shimano hubs and Michelin Dynamic tires. MSRP: $199.99. The world's best value in after-market wheels. Carbon Pro - Feature carbon fiber rims, Alpina alloy CNC spokes and Michelin X Comp tires. MSRP: $1,099.99. Carbon Pro Matrix - More affordable carbon mtb wheelset featuring carbon fiber rims, Alpina alloy CNC spokes and Michelin X Comp tires. MSRP: $999.99. X-Lite Downhill - Extra tough monocoque carbon fiber wheelset with Tioga Blue Dragon tires. MSRP: $699.99. X-Lite - An affordable after-market wheelset for all-around off-road riding. Boasts alloy rim and spokes and Michelin X Comp tires. MSRP: $499.99. ChromeLite - Alloy rims with stainless steel spokes and Michelin X Comp tires. MSRP: $299.99. StarLite - An entry-level wheelset featuring Shimano hubs, alloy rims and spokes, and Michelin Country Trail tires. MSRP: $199.99. A great price-point for a great wheelset. "Vuelta wheels are the greatest value in aftermarket wheels," says Karen Peterson of Lexco. "The wheelsets are made in Italy, feature Shimano or Vuelta hubs, Michelin tires, and various price points. Plus, Vuelta wheels are shipped in their own bright, attractive packaging which means they can be hung or set anywhere in a shop producing a nice display." Says Tom Curran of Vuelta: "Through many decades of hard work, Lexco has earned the reputation of being one of the stellar distributors in the U.S. mostly by offering impeccable customer service and excellent products. We are extremely pleased Lexco will be distributing Vuelta wheels and look forward to a long-term joint effort in selling the world's fastest wheels."